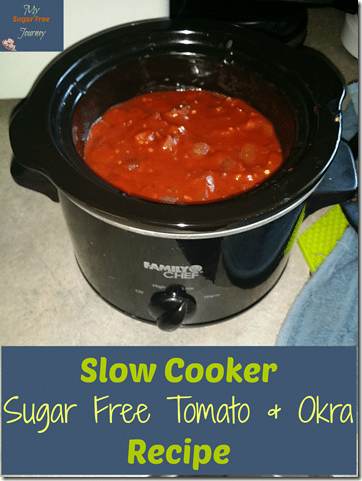 Delicious Slow Cooker Okra and Tomato Sugar Free Recipe! I absolutely love okra. I grew up eating it in gumbo, my dad always had a jar of pickled okra in the fridge, fried okra always went with the fried chicken and a can of okra and tomatoes was a common side dish. So I thought I’d try my hand at an okra and tomatoes recipe and was so happy with how it turned out. I used fresh okra but if you can only find frozen, that should work also just don’t get the breaded kind. Also beware of over-cooking, my first batch was allowed to simmer overnight and was almost completely liquid. Also beware of the tomato sauce because sometimes they like to add a little sugar to the recipe. 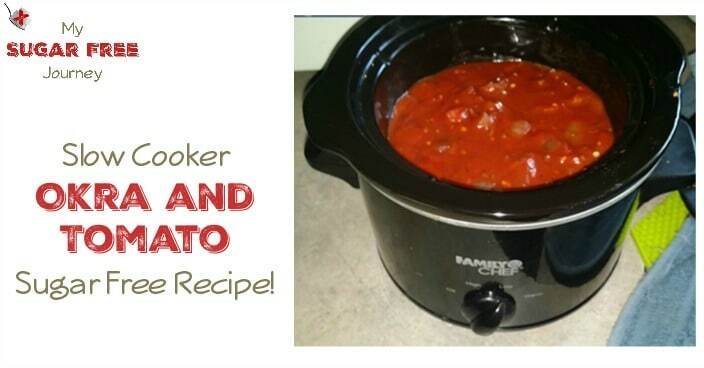 Just check the recipes and make sure it’s just tomatoes and possibly salt. A super easy and delicious Okra and Tomatoes recipe that you can throw in the slow cooker and go! PREVIOUS POST Previous post: 5 Steps to Break Your Sugar Addiction! NEXT POST Next post: 8/27 Weightloss Wednesday: 26 Lbs Down!